According to a new report published by Transparency Market Research (TMR) titled ‘Furfural Derivatives – Global Industry Analysis, Size, Share, Growth, Trends, and Forecast, 2018–2026, the global furfural derivatives market was valued at around US$ 2.0 Bn in 2017 and is anticipated to expand at a CAGR of over 3.1% from 2018 to 2026. Rise in demand for furfural derivatives in bio-based products drives the global market. 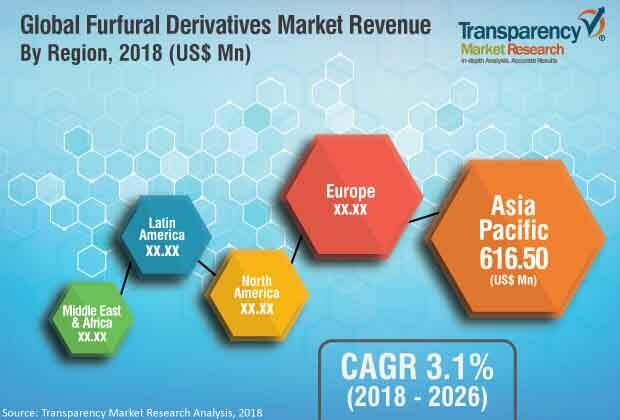 In terms of value, the furfural derivatives market in Asia Pacific is anticipated to expand at a CAGR of over 3.5% during the forecast period. Rise in demand for furfural derivatives from petrochemical industries and improvements in the production methods of furfural are likely to propel the furfural derivatives market. Rise in the usage of furfural derivatives in bio-plastics and petrochemical industries is expected to propel the furfural derivatives market. The production of polyethylenefuranoate (PEF) from FDCA has environmental advantages. For instance, it reduces the use of non-renewable energy by 51% to 58% as compared to that of polyethylene terephthalate (PET). FDCA produces greenhouse gas emissions ranging between 1.4 and 2.1 tCO2/t-product as compared to that of fossil PET emissions which ranges from 3.8 to 4.4 tCO2/t-product. This saves approximately 60% of the fuel. The others segment accounts for a dominant share of the furfural derivatives market. The segment includes furfural which is combined with other compounds such as methane and amine. Other furfural derivatives include 2-methyltetrahydrofuran (2-MeTHF), furfurylamine, levulinic acid, and succinic acids. Based on end-use industry, the furfural derivatives market has been divided into plastics, agrochemicals, food & beverages, pharmaceuticals, industrial chemicals, refineries, and others. Various green initiatives, norms, and regulations imposed by governments and regulatory bodies regarding carbon emission are propelling the biopolymers industry. This, in turn, is increasing the adoption of furfural derivatives polymers. Furfuryl alcohol is used for making antimicrobial agents in the pharmaceutical industry. Furthermore, furfural derivatives are employed to manufacture synthetic pyrethroid insecticides in the agrochemicals industry. Based on region, the global furfural derivatives market has been categorized into North America, Europe, Asia Pacific, Latin America, and Middle East & Africa. North America and Europe hold large share of the global furfural derivatives market, as most industries in these regions are well established. North America constitutes a significant share of the global market. Rise in use of furfural derivatives in agrochemical and plastic industries in developing economies such as China, Japan, and India is projected to boost the market in Asia Pacific. The market in Middle East & Africa and Latin American is estimated to expand at a moderate pace during the forecast period. Key players operating in the global furfural derivatives market include Ashland, Inc., Avantium Holding BV, BASF SE, DynaChem Inc., Hongye Chemical Co. Ltd., Corbion NV, Sinochem Qingdao Co. Ltd., Pennakem, LLC., Nova Molecular Technologies, and Mitsubishi Chemical Holdings Corporation. Major players engage in acquisitions or joint ventures to improve their market position.